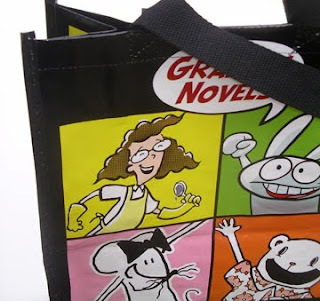 Author/Illustrator Matthew Holm: Tote that bag! Lift that book! Jarrett has some pics of a nice tote bag that Random House and the folks at Perma-Bound teamed up to create. It features a bunch of nutty RH graphic novel characters, including LUNCH LADY and BABYMOUSE. If you're a teacher that plans to be at the NCTE conference in Philly this week (where Jenni, Jarrett, and I will be talking Graphic Novels), you just might pick one up so you can haul your loot around!